Architecture firm Saavedra Arquitecto, with headquarters in Marbella (Málaga), led by Juan Jesús Saavedra Aranda, undertakes projects for leading commercial brands, and was in charge of designing Multicines Odeon Sambil, in Leganés (Madrid). 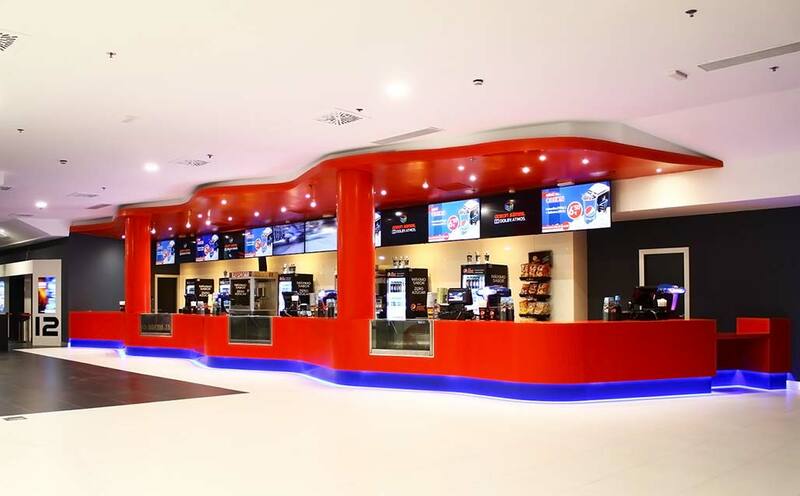 Renowned for being the most modern cinemas in Europe, Multicines Odeon Sambil is the first in Spain to incorporate advances such as Dolby Atmos and Christie Vive Audio, 4K Christie Laser projectors with EWD technology, and something that all cinema enthusiasts will enjoy – all seats are VIP quality in each of its 12 screens. Saavedra Arquitecto has taken advantage of some of the properties offered by the solid surface from PORCELANOSA Group, and the KRION® transforming company, Grupo Damare, has masterfully transformed the spectacular counter located in the foyer of the cinema. A 21 metre long bar has been created with the 6405 Happy Red colour and finished with a 6704 Navy Blue skirting. With the same KRION®, Damare also covered the two 60cm diameter, 3 metre high columns, using the complex technique of thermocurving these pieces, which gave the establishment the additional character sought by the modern Multicines Odeon Sambil.